The memorial on the D703 at Carsac to the members of the Resistance who died there on 8 June 1944. These people clashed with Das Reich (Adolf Diekmann's men) just after they had crossed the river at Groléjac and whilst they were still fresh from the action against the Resistance there. 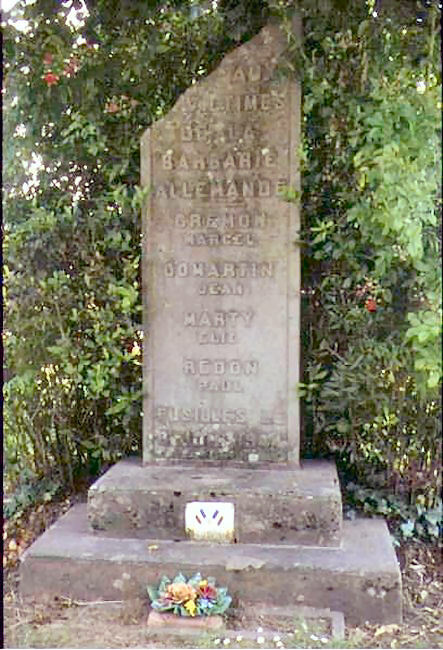 The inscription reads, "For the victims of German barbarity, Marcel Gremon, Jean Domartin, Elie Marty, Paul Redon, shot 8 June 1944".